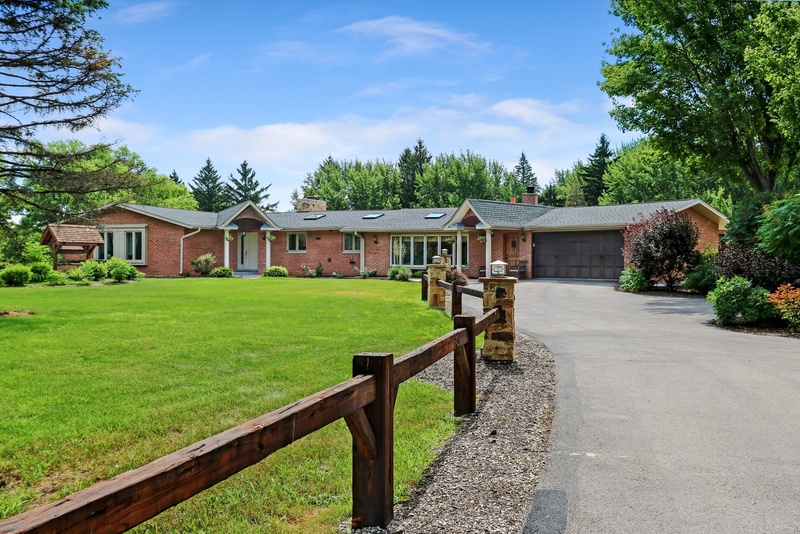 Exuding all the grace & elegance Barrington Hills offers in this magnificent ranch! Perched on 5.1 acres, this breathtaking residence has been extensively refined with custom finishes & unrivaled living space. Expansive floor plan with vaulted family room opens to kitchen with exposed wood beams, fireplace & access to remarkable outdoor entertaining space! Intimate dining room also opens to exquisite kitchen each with yard views while featuring 42" white custom finished inset cabinets, contrasted breakfast bar, leather finished granite, double oven, Sub-Zero, built-in espresso machine & travertine floors outlined in walnut. 1st floor also features 3 bedrooms & 3 new full baths consisting of master suite with fireplace, walk-in closet, double vanity & shower. Finished lower level with wet bar, media area, 4th bedroom, new full bath & wine cellar. 3-car garage! Resort living with pergola, outdoor kitchen, built-in grill, smoker, fireplace, pool, 3,000 sqft heated shop/barn & Coy pond!